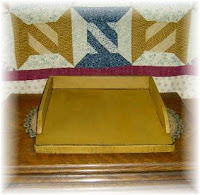 This week's Web Site Special is for this fabulous small dough board. It is the perfect size to use on your counter or table. You can't beat the price at $7.99 each! And also this little stitchery to add to my collection! We had so much fun spending the day together, just the two of us. I picked her up in Winston-Salem, brought her back to my house for a while, loaded up my wagon with goodies and went to Walnut Cove. 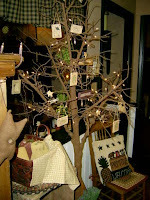 Added lots of new items to my booth there and then shopped around a little bit. She found several things to take home with her. 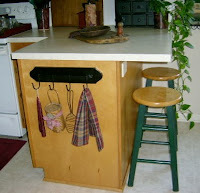 ( Oh shoot, forgot to take pics ) I had made her a kneeling bench that she is using at her fireplace ( like mine). She decided to do it similiar to the way I have done mine. After Walnut Cove, we came back to my house once again and realized that we had just enough time to run over to the Antique Marketplace in Greensboro. 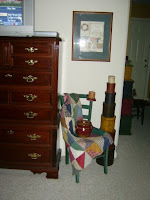 She found a few more things, including a runner like I had gotten last week out of the red/beige woven fabric. This is the one I bought last week...very, very nice! Gotta run for now! Last day to enter my giveaways!! Hurry, hurry, hurry! Another busy day in K-ville on this rainy Friday. I think I am running out of my favorite things to post, so maybe I'll just share some of the things that I have been working on all week and a few things that I found when I went shopping this week. I was so excited when I found this whale tale shelf. The perfect size for a pottery jug and woodeden plate. 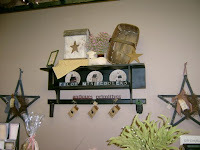 A new black board with wrought iron hooks. It fits perfectly at the end of my breakfast bar. Finally, figured out that I like the little mustard table best beside this chair. You can barely see the tobacco stick ladder in the corner. 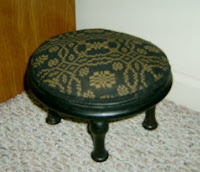 Retha gave it to me...it's good size for a corner. Afterthought....does anyone know what I can do to keep my internet from shutting down when I go to blogs that are photo intensive or that play music?????? ?Almost every single time, my computer will just STOP....any ideas?? I have Vista as my operating system. This has been the screwiest week for me. When we have a Holiday on Monday, my whole week is topsy turvy! Hubby was home so I didn't get as much done as I would have liked to. Tuesday, I played catch-up from Monday. And again yesterday, I worked on orders, packed them up and got to the post office before they closed. We had rain and storms, and then rain and then more rain to the point our electricity went out last night. Not sure exactly what happened, but know for sure it's always a lot of fun when the lights go out!! I'm always reminded of how much we are so dependent on electricity when ours goes out. I had to scramble to find emergency candles and a flashlight. You'd think that I would have a stash of both as I can't remember how many times it went out last Summer....almost everytime it stormed. Last evening, it went out around 10:00 and came back on in the wee hours of the morning. Can't tell you how many times I sat down at the computer or tried to switch on lights. Too Funny!! We had rain off and on all day today. And they're calling for rain and storms for tomorrow. Our grass is growing like crazy and by the time Bill can get around to it, it'll be even worse. I should get out there and try to mow it myself, but.......I'm so far behind on orders and web site "stuff" that I will probably end up working some this weekend. I went to a new Dr. today and we all know how much fun that can be. Personally, I think it's a waste of time. I had planned to take a month off from Drs., medicine and the whole bit, but noticed that I'm a little pale and my breathing isn't what it should be, so I picked up my NEW medication on Tuesday. The side effects are not too bad, although I got really nauseated this afternoon. It quickly passed, so I'm good to go. I also went shopping for a couple of outfits for our up-coming trip in JULY. It normally takes me forever to find a dress, but I really lucked up today and found several things that will work nicely. I tried on tons of dresses at the Mall and 3 came home with me plus a formal look pant suit. I tried them all on for Bill and Cait and they couldn't decide which they like best. Bill says keep 2 of them........we'll see. This makes my 205 post and 3 days left to enter my giveaways! There's a pile of stitcheres over here calling out my name, so I should run for now. Hope everyone had an enjoyable Memorial Day! We had a nice visit with my Sister (Elaine) and Brother-in-Law (Dale). They were here because Dale's Mom is in Baptist Hospital at Winston-Salem. Our thoughts and prayers are with y'all. Just a reminder....still a few days left to enter the giveaways for May. I have to say, I am shocked at all the folks who have entered! The most ever in one month! 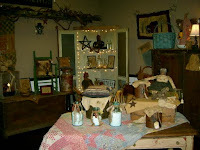 Well folks, "Handmadens" has officially CLOSED our booth at the Antique Marketplace in Greensboro! 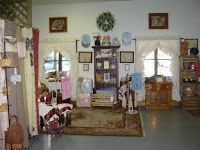 Retha and I went this afternoon and picked up the last of our "stuff" and the rest of the displays. What a job, not near as much fun as when we were taking it in and setting it up. It was pouring down rain and that just made it worse....I am still having a lot of mixed emotions about it. They were so busy today that we could hardly get up and down the aisles. I just have to wonder if we could have waited a couple more months, maybe it really would have made a difference. I know in my head that people came there looking for Antiques and it was probably just a fluke that we sold anything at all, but still............I put my heart in to it and it's sad for me. It's beginning to rain here. We need a nice shower as our yard is beginning to turn brown. Hopefully, it is just passing thru. Lots of folks cooking out today! Happy Memorial Day to all! sorry, it took me so long to get Thursday's post-posted that I am a day late with Friday's Favorites. First of all, I need to explain a bit about this. I have gone back and forth for a while on what to do with this ugly florescent light over my sink. 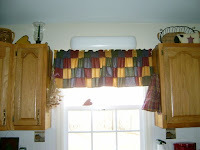 We tried to find a replacement, but it is wired so screwy that we couldn't find anything the right size. Bill offered to re-do the drywall and the whole bit, but I just don't feel like the mess right now. Pretty cool idea, huh?? And didn't cost hardly anything. Today was one of those DAYS when I didn't accomplish a whole lot.......actually I didn't do hardly anything but putz around the house. It was a beautiful, sunny day and usually I am so productive on these kind of days, but not today.... I think maybe I just needed a slow day. It was late in the afternoon before I even got in the shower!!! (I am usually up and ready to go by 7:00- complete with makeup! ) And I probably wouldn't have by then, but had to go to the store to pick up a few things to make dinner. We had bratwurst complete with peppers and onions, potato salad, baked beans and chips for anyone that wanted them. Pretty tasty! 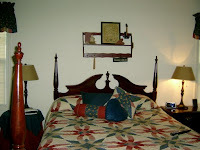 On to more exciting things..........I've been working on our bedroom a little when I have had a few minutes to spare. Obviously, it hasn't been a priority, as it's not my favorite room in the house. We actually use it for more than just a bedroom...Bill's computers, servers and office is in the one end. I have my exercise bike in an opposite corner. What DO these die hard prim decorators do with their computer "stuff" and the like??? We absolutely have to have access on a daily basis. Plus, my furniture is a little too formal for my taste these days. Don't get me wrong, we have a really nice set that we purchased several years ago when we lived in the 3,000+ square feet, 3 story Traditional Colonial House. Lots of changes since those days! 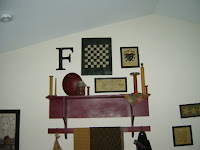 I have decided to use my prim goodies, regardless...and I must say the room is much homier and cozy. Has anyone else been having issues with google? 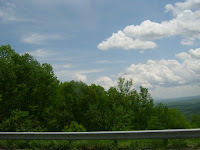 It seems to be a little better, but earlier I couldn't access blogs at all. I think I can finally get this to post! As it turned out....I spent most of the day sewing! 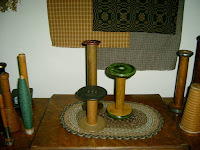 I had several Prairie Dresses and Dusting Caps that I needed to make up for orders. These are so cute! I'm making one for myself to hang in my bedroom, maybe on one of the bedpost??? After having a conversation with a dear friend of mine...I have decided today that I am adding a new category on my web site. 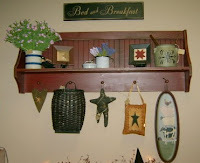 It will be for goodies (mostly wood pieces) that I happen to find and re-do, strictly one of a kind items. Look for it soon!! Don't forget! Getting close to my 200th post, but you have the rest of the month to enter. I missed doing "anything" for my 100th post....it didn't EVEN cross my mind. So I decided to do something for my 200th and that will be any day now. This is the way it will work....Thought it might be nice to enter everyone that makes or has made a comment thru the month of MAY! And then do the drawing on the 31st. So keep in mind....for each comment, you'll have 1 entry. And if you sign up to be a follower, you'll get another entry! Plus you'll also be entered in my web site monthly contest~~yipee! 2 drawings! 2 Prizes! A burgandy cutting board, Primitive Collector mini sign, mini sugar cone wrapped in grungy cheesecloth, a jar of rag balls topped with homespun, metal star, room spray, grungy candle and holder, little bunch of Sweet Annie plus a homespun doily! 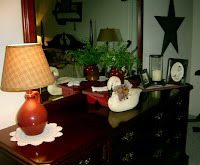 First, I want to thank everyone that leaves a comment(s) or signs my guestbook! I try to answer most, but haven't quite figured out how to always do it. 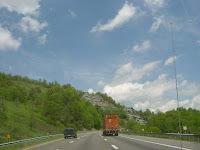 Please be sure and send me an email address if you don't have a blog.........and the reason for that is~~~I am nearing my 200th post and everyone that leaves a comment in MAY (on my blog) will be entered in a drawing for a Givaway! I will post more about this tomorrow. I also wanted to share Betty and Dan's new address for all of you that might be in the area or going to the area. Also here's the address for Tammy's fabulous store. 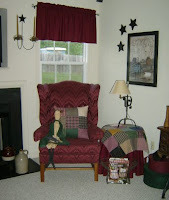 More OOAK SALE items added on my web site today! I have finished the lids to my crocks and wanted everyone to see! I love, love love the way they turned out! They look so nice in the kitchen. I painted the lids a really nice green that compliments the crocks so nicely. Cait suggested the color but, I was a little apprehensive at first.. I usually paint everything black, and wasn't sure that I would like the change. BUT, it looks so nice that I'm glad I listened to her and went with the green. These are a few of the goodies I have for sale from the (closing) craft booth. I'll be adding more all week, so keep checking back for the bargains! 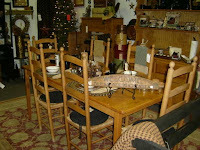 Later today, I will be adding some great bargains to my web site. I have lots and lots of prim goodies from the booth in Greensboro that I have decided to sell on my site instead of packing them away. Some have never been offered before. Everyday this past week was so busy for me that I decided to do as little as possible today. I didn't even want to go out to breakfast. Stayed in my jammies until 9:00, made some sausage and eggs and proceeded to find something to watch on TV. BIG shocker!! Nothing and I do mean nothing on TV to spark my interest. So I decided to think about making a pork roast in my crock pot. I have been wanting to make BAR-B-Q for a long time and today was the day. I must say it turned out pretty fabulous!! But, we have enough to feed a small army! LOL! Maybe I can freeze some of it. Another one of my tweaking days resulted in this.......re-did this wall last week. I added some samplers and I made the checkerboard to fit the space. I am REALLY happy with the way it looks now. It has been hard to get the desired look with the cathedral ceiling, but everyone has commented how much they like it this way. 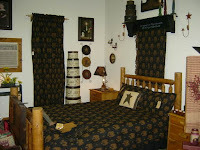 I also took down my quilt from the rack and added a couple new things, including the runner from Crockett's Store. 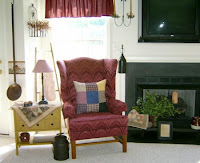 I made a new round table "topper" from patchwork and new pillows for my wing back chairs....very pleased with that look as well. As soon as I can decide on some fabric, I'm covering my lampshades. I covered one in my dining room and I still like it so that's a plus. 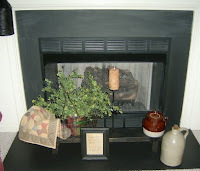 Next, we have my fireplace...I have been racking my brain for something a little different for the Spring/Summer. Decided that I really like the greenery in my wire basket. 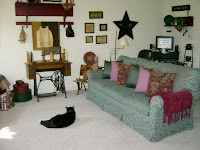 I think I will re-paint my kneeling bench tho, in a burgandy or mustard color. It doesn't show up as well as I would like for it to. 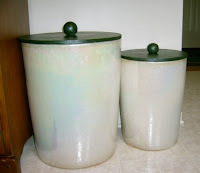 Finally got my lids made for the crocks that I want to use for trash and recycling in my kitchen. It has been weeks since I bought the crocks, but I haven't had a chance to look for wood. I ended up buying 2 pieces of 24 x 24 oak something or another. It was really easy to cut and they turned out SOOOO nice, but I didn't get them painted yet.....maybe tomorrow! I have sat here way longer than I intended to...more pictures to follow in the coming days. I tried to get this posted yesterday, but to no avail.............my blogger wasn't participating! I have had several issues with a few blogs that I read as well. It seems fine now, so we'll see. 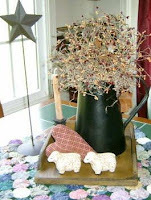 Today I am sharing a little craft tid-bit. 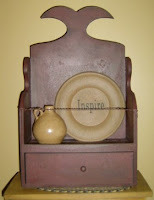 This is the one that I am most interested in as I have several stencils that have been used over and over again. Your stencils must lay out flat and be completely dry. 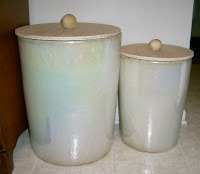 Completely cover with cleaner and leave them alone to soak. Return in an hour or so and rinse well in the sink or outside with a garden hose. They should be clean and ready to use again........Has anyone actually tried this?? I would love to hear how it worked. I hope to try it in a few days myself. Also wanted to share this with y'all! 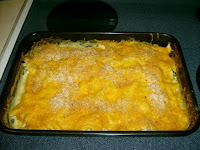 We had this for dinner on Thursday evening and I loved it!!! I have had a very sheltered life where food is concerned, cause I don't usually like anything!! LOL!! 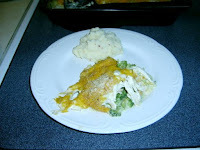 Served with loaded mashed potatoes and a small garden salad. YUMMY!! Well, my usual Friday Favorites may be along later this evening or definately tomorrow. 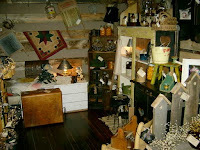 I have had such a busy day, went to the Marketplace plus took some new goodies to Walnut Cove!! Then on to the grocery store and actually made dinner at home tonite!! But, I'll try to get back ASAP. 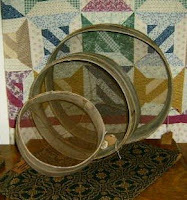 After several weeks of careful consideration~~~ Retha, Deb and I have decided to close our booth at the Antique Marketplace in Greensboro. This was really a tough decision for me and Deb. I have to admit that this really makes me sad. We had such a nice space and were beginning to get it filled like it needed to be. And the folks there are soooooooo nice! I will miss seeing Leonard and Rhonda on a regular basis. I think that I will start getting some of my stuff out today, a little at a time. We will officially be out by the first of June. I love doing the booth thing so much and will be looking for somewhere else close by that I can sell my wares. Anyone have any ideas???? One bright note tho, I have a lot of new goodies that I can take to Walnut Cove, so be on the lookout for them there. I have orders to do so I'll be back later. I sincerely meant to get back here on Sunday for the rest of the story, but this is the first chance that I've had to this. The past few days have been pretty crazy around the Freshwater's. But, back to Saturday's adventure. My sister came back for a visit. Yea, 2 visits in 2 weeks! 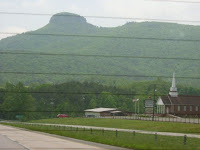 I have told her numerous times about the Pilot Mountain Peddlers Store and we decided that was where we needed to go. 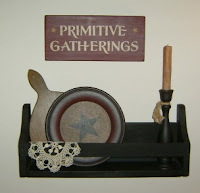 Pilot Mountain Peddlers has been filled with lots and lots of primitive gatherings and you're sure to find something to use in your own home. And Tammy is right there to offer ideas and suggestions. It is well worth the trip and I'll be going back soon! Only next time, I'm taking my list.......there is so much to choose from, it's hard to decide on what to purchase. After much thought and deliberation, this is what I decided to bring home with me to K-ville! 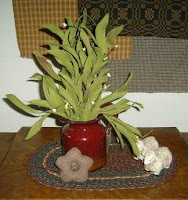 ....a beautiful braided mat, set of sheep salt and pepper shakers, a homespun flower, a greenery bush, cute little pottery pitcher in a burgandy/ gold color, plus a wonderful prim shelf that I'll have to post at a later time. Thank you so much, Tammy for being so gracious! While we were there I ran into Sherie. The gal that used to own the store. She is super nice and I always enjoy chatting with her. I don't think I will ever forget the first time we met....before I even told her who I was, she knew me!!! It was really quite a meeting! Hope all you Mom's out there have a great day! 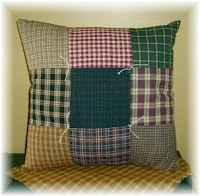 This week's web site special is this wonderful prim pillow! Only $6.99 for a limited time. I'll be back later with yesterday's adventure! And what a wonderful day it was!! 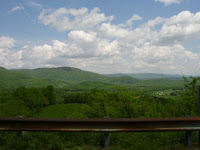 Deb, Retha and I went on a road trip to Fancy Gap to visit Betty and Dan from Crockett's Country Store. It was a fabulous trip ( at least, I thought so)! 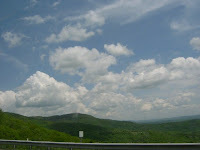 It was the perfect day to be in the mountains. If you are ever in the area........YOU must visit Betty and Dan! 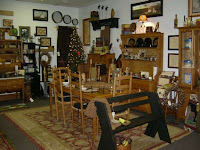 They've only been open a few days and their store is full of primitives, antiques and sooo much more!!! I don't think you will be disappointed!! 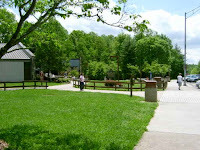 Before we left Fancy Gap, we had lunch at the Deli across from the store. I had a wonderful homemade tomato and spinach Quiche. 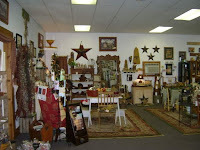 On the way home, we stopped at one of Retha's favorite antique stores. It was one of the most interesting places I have ever shopped at! I found a few things to bring home with me that I will share later. 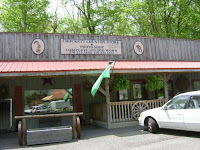 And lastly, we stopped at one of Deb's favorite Fruit/ Flower Markets on the VA~NC state line. They had a huge selection of fruits and all kinds of flowers and hanging baskets and tons and tons of candy, including what used to be penny candy. I think we all were pleased and had fun with our adventure!! Needless to say, we were all pooped when we arrived back in Kernersville and I can't wait to go back!! !